Meigs senior Cole Adams (3) breaks away from an Alexander defender during Friday night’s Week 10 TVC Ohio football contest in Albany, Ohio. ALBANY, Ohio — Senior night is always an emotional evening, players donning the teams colors for the last time, wondering why the four years has gone quickly. Friday night, the Marauders fought the elements and emotions for a hard fought 8-0 win over the Alexander Spartans. The Marauders were also fighting for one of their own. Last Saturday morning, senior football player David Robson was involved in a serious car accident. Robson was transferred to a Columbus hospital, and it appears the young Marauder is now paralyzed from the chest down. So the Marauders were not only battling the Spartans, but emotions along with a mess — to put things mildly for field conditions. Friday’s all day rains made the turf at Alexander a soupy mess with standing water everywhere. Not only the players had trouble with footing all night, but more than once the officials were also falling. On top of that, the Marauders outstanding freshman quarterback Coulter Cleland was very limited with an injury to his throwing hand sustained in practice earlier this week. How bad was it? The teams combined for six first downs and 113 total yards. The Spartans had one first down, four yards rushing and 19 total yards. The first period was a battle for field position in the muddy mess. All but two plays were played in Marauder territory. The Spartans picked up their only first down of the game on the game’s third play. Neither team was able to pose much of a threat in either period and the teams went into the locker room tied at zero. On the Marauders second series of downs, Cole Adams found some footing on the far sideline and went 70 yards for the score, but the Marauders were called for an block in the back well behind the play — nullifying the score and moving the ball back to the 50. Meigs was able to move the ball to the 33, but the drive stalled and Cleland punted the ball to the Spartan six. Meigs held on downs and Adams returned the Spartan punt 26 yards to the Spartan 10 where he stepped out of bounds. On second down, Adams once again took it down the far sideline 10 yards for the score. Sophomore Abe Lundy went up the middle and drugged almost the entire Spartan defense into the end zone for the extra points to give the Marauders an 8-0 lead with 11:14 left in the game. The rest of the game came down to field position, as the best the Spartans could do in the final period was move the ball to their own 15. A Spartan punt gave Meigs the ball with 5:21 left at the Alexander 41. Meigs played ball control and ran almost four minutes off the clock, but a fourth down pass on a fourth and goal fell incomplete. Four plays later, Alexander gave the Marauders back the ball at the Spartan 15. One snap later, the Marauders had escaped with the win. Meigs finishes the season with a 4-6 record and 4-2 in the Ohio Division of the TVC, the win coupled with Athens’s 49-14 win over Nelsonville-York put the Marauders in a second place tie with Nelsonville-York. The Spartans fall to 4-6 and 3-3 in the TVC. Meigs now owns a 29-5-1 all time mark against Alexander. After the game, both teams formed a circle holding hands and prayed for David Robson, Meigs gave his father also named David the game ball, and an Alexander fan who won the game ball from the Spartans also presented that game ball to the Robson family. The Spartans also took up donations for the family, and gave the Robson’s the school’s half of the split the pot, which the winner also donated it back to the family. Robsons’s classmate Dalton Workman, switched his jersey from his number 35, to Robson’s number 14 to honor his teammate. An emotional elder Robson spoke to the Marauders in the locker room after the game. Calling the team his family, thanking the kids for all their support. He ended his talk to the players with the Marauder rallying cry “ROCKSOLID”. 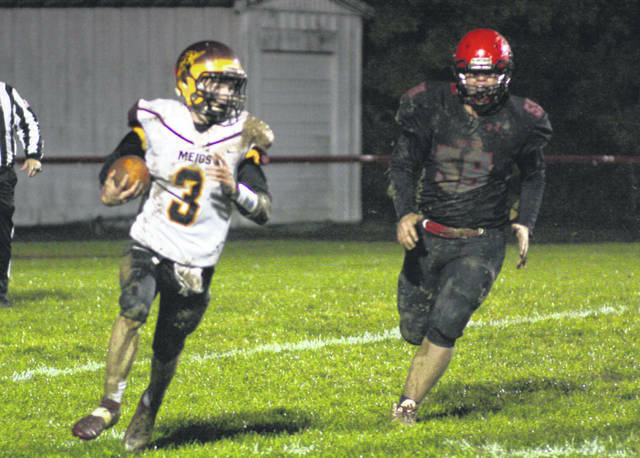 Adams led the Marauders with 46 yards in 16 tries, Zach Bartrum chipped in with 39 in 12 carries. Cory Cox was three for seven in the air for 13 yards, Cleland was two for three for 3 and Bartrum failed to complete either of his two passes. Bartrum had three catches for four yards, Weston Baer one for 12 and Adams one for minus 6. Connor Kimbrough carried 19 times for just 10 yards to lead Alexander. Kaleb Easley was two for seven in the air for four yards. Logan Neal caught one for nine. Playing their final contest for Meigs were Zach Bartrum, Cole Adams, Clayton Hanna, Wesley Smith, Dalton Workman, Austin Hart, William Smith, Donovin Chapman and Clayton Neutzling, and the aforementioned Robson.